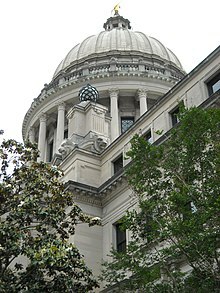 The Mississippi House of Representatives is the lower house of the Mississippi Legislature, the lawmaking body of the US state of Mississippi. According to the state constitution of 1890, it is to comprise no more than 122 members elected for four-year terms. To qualify as a member of the house candidates must be at least 21 years old, a resident of Mississippi for at least four years, and a resident in the district in which he or she is running for at least two years. Current state law provides for the maximum number of members. Elections are held the first Tuesday after the first Monday in November. The House has the duty under the Mississippi Constitution to select the Governor of Mississippi if no candidate receives more than 50% of the vote. The power has only been exercised one time, in 1999 when state representatives selected Ronnie Musgrove to serve as governor, after he had won a plurality of the popular vote in that year's election. The current membership reflects the balance of power after the 2011 elections, which was the first election since Reconstruction to give a majority of seats to Republicans. Article 4, Section 36 of the Mississippi Constitution specifies that the state legislature must meet for 125 days every four years and 90 days in other years. The Mississippi House of Representatives has the authority to determine rules of its own proceedings, punish its members for disorderly behavior, and expel a member with a two-thirds vote of its membership. Bills must undergo three readings in each house, unless two-thirds of the house dispenses with the rules. They cannot be amended to a new purpose. Amendments to bills must be approved by both houses. The governor has the power to veto legislation, but legislators can override the veto with a two-thirds decision. State representatives are authorized under the Mississippi Constitution to select the Governor of Mississippi if no candidate receives more than 50% of the vote. This has occurred only once, in 1999, when Ronnie Musgrove was selected (Musgrove had the most votes statewide, but fell a fraction of a point shy of a majority). State representatives earn $10,000 per year. The following composition reflects the balance of power after the 2015 elections, which was the second election since Reconstruction to give a majority of seats in the State House to the Republicans. State representatives are elected every four years by the qualified electors of the district for which they are running. Candidates are required to be at least 21 years of age and a resident of the state and district for which they are campaigning. ^ a b "GOP takes Miss. House for 1st time in years". Boston.Com. November 14, 2011. ^ Republican Bill Kinkade elected to succeed Woods. ^ Democrat Jason White (District 48) switched to the Republican Party. ^ Republican Brent Powell elected to succeed McGee. ^ Democrat David Gibbs (District 36) died. ^ Democrat Joe Gardner (District 11) died. ^ Republican Jessica Upshaw (District 95) died. ^ Democrat Karl Gibbs elected to succeed Gibbs. ^ Democrat Lataisha Jackson elected to succeed Gardner. ^ Republican Patricia Willis elected to succeed Upshaw. ^ Democrats Kelvin Buck (District 5), George Flaggs, Jr. (District 55) and Billy Broomfield (District 110) all resigned when they assumed office as Mayors of Holly Springs, Vicksburg and Moss Point, respectively. ^ Democrats John Faulkner (District 5), Oscar Denton (District 55) and Jeramey Anderson (District 110) are elected in the House of Representatives. ^ Democrat Randall Patterson of Biloxi (District 115) switched to the Republican Party. ^ Democrat Esther Harrison of Columbus (District 41) died. This page was last edited on 6 February 2019, at 05:33 (UTC).